Shelby American has been tight-lipped about the 2012 Shelby GT350 Mustang but if they are going to such great lengths to debut the new model, you would think that there will be some substantial improvements. Shelby’s press release announcing the 2012 GT350 coming to Chicago didn’t mention any specifics but a member of The Mustang Source snapped some images of the Shelby area during setup – revealing that we can expect the 2012 GT350 to come in a variety of colors (2011 models were only available in white with blue stripes) and most importantly, the cars captured in the cell-phone shots were all convertibles. The 2011 Shelby GT350 Mustang (pictured above) modified the car in almost every way, from the interior to exterior and every aspect of the drivetrain. It stood out from other 2011 Mustangs with its unique body kit and the addition of the Shelby/Whipple/Ford Racing supercharger ups the output of the new 5.0L V8 to either 525 or 624 horsepower. This coupe-only 2011 GT350 carried a post-title price of $33,995 (add $750 more for the 624hp package) plus the cost of the 2011 Ford Mustang GT donor car but on the Shelby American website, you can price out your dream GT350 with all of the available options. When you go through this process, it includes the price of the base vehicle so you can see exactly how much it costs to buy one of these super rare, high performance Shelby Mustangs. 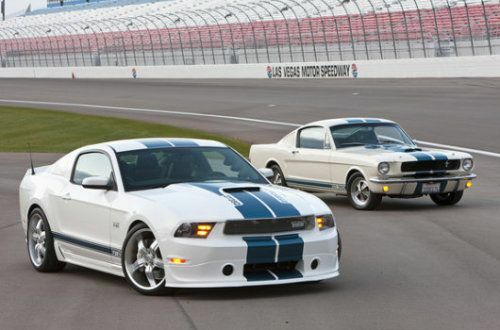 Click here to build your own 2011 Shelby GT350. TorqueNews.com will be at the 2011 Chicago Auto Show bringing you all of your breaking news and coverage, including more information on the 2012 Shelby GT350 Mustang.